Rory McIlroy and the European Tour have massive plans for the Dubai Duty Free Irish Open but there’s doubt about Lough Erne Resort’s planned hosting in 2017 and utter confusion between the tour and the Irish Region of the PGA over a possible qualifying event. Not only is the Lough Erne Resort no longer certain to host next year despite being officially name as the 2017 venue two years ago, but the Irish Region of the PGA deny categorically they have been in talks with the European Tour about an official Irish Open Qualifier. On the future of Lough Erne as the 2017 venue, Antonia Beggs, Championship Director of the PGA European Tour, deferred to her new boss, Canadian Keith Pelley. “The new Chief Executive came on board in August as a very dynamic individual who is currently assessing the strategic placing of the Irish Open and that will involve prize fund, it will involve the date and venues and that is all being discussed at the moment.” she said of any possible change of date going forward and the strategy concerning the venue. She added: “Keith Pelley says we are not working as individual tournaments but as the European Tour and we have to get as many great players as possible playing and then work out which tournaments they play in. “There is no definitive decision (about Lough Erne) and I am not going even begin to speak on the CEO’s behalf or I’ll have my P45 tomorrow. “The Irish Open is such a key part of the overall strategy and as one of the biggest tournaments that there is in golf, he is looking at it as part of our overall strategy. “We have a once-in-a-generation superstar in Rory McIlroy hosting this tournament, who transcends not just golf but sport in general. The doubts about Lough Erne will be of major interest to Northern Ireland’s current First Minister, Arlene Foster, a Co Fermanagh native.When asked during the Open Championship announcement at Royal Portrush last October about the possibility that the 2017 Irish Open might not go to the Enniskillen resort in her native county after all, she said: "You'll have to ask the European Tour. The announcement has been made. As for the Irish Open Qualifier, the PGA Irish Region says categorically it hasn’t been consulted about the possibility that the Tour may replace the traditional, automatic places awarded two the top six in last year’s Irish Region Order of Merit with an irish Open Qualifier. A similar event was staged in Scotland last year with five spots awarded in the field for the Aberdeen Asset Management Scottish Open at Gullane to the leading five professionals or amateurs a 36-hole, £50,000 Aberdeen Asset Management Scottish Open Qualifier, held the weekend before at North Berwick. That event was open to PGA qualified club pros, assorted mini tour professionals and even amateurs with one of the amateurs making the Gullane field. Ms Beggs said: “This one isn’t Keith Pelley’s strategy but we’d love to run a competition for the (PGA) pros. If we are looking after the amateurs, let’s look after the pros in the golf clubs as well and get them engaged with the tournament. However, when contacted for comment, Irish Region secretary McCumiskey said it was news to him and he was adamant he’d heard nothing from the European Tour or Ms Beggs and spoken with no-one about a qualifier. In recent years, the European Tour has offered six spots to the Irish Region of the PGA, which Dundalk has awarded to the top six eligible players in the previous season’s Order of Merit. Last year’s Top-6 were Eamonn Brady (Clontarf), David Higgins (Waterville), Colm Moriarty (Drive Golf Performance Limited), Neil O’Briain (Old Conna), Damian Mooney (Nevada Bobs Belfast) and Brendan McGovern (Headfort). Losing all six places to a potential Irish Open Qualifier would be contentious even if Dubai Duty Free were to pump thousands into an event that would count on the Irish Region’s schedule. While she was unsure what might happen, Beggs indicated that losing all six spots was not the preferred option. “Categorically we can say that we would never take all of those places away,” she said. "There is no definitive answer at the moment. "If there had been, we would have announced it today. We wanted to announce something today. But I would expect us to make an announcement on whether it is going to happen or not in the next two to three weeks. As for the Dubai Duty Free Irish Open proper, McIlroy wants to get Irish clubs heavily involved in an event that Pelley regards as one of the foundation stones of the European Tour and a key part of his strategy for the future. In co-opertation with the European Tour and his Rory Foundation, four-time major winner McIlroy has come up with a five point plan to bring back the glory days of mass club participation in the event which will be played on the Palmer Ryder Cup course from May 19-22. With The K Club capable of hosting 45-50,000 fans a day at the 2006 Ryder Cup, organisers are dreaming of another sell out week and hoping to get at least 100,000 fans to see McIlroy and some of the world’s elite play for boosted, €4 million prize fund. The new initiatives include a chance for clubs to send a mixed team to compete in the tournament Pro-Am via regional and national qualifiers for the Dubai Duty Free Irish Open Club Challenge. An “Irish Open Skills Challenge” and “Get Into Golf With Rory” initiative will also be run to encourage under 15s and schools to get more involved in the game while there will also be special ticket and coach offers exclusive to golf clubs so they can organise a big day out at The K Club next May. McIlroy is asking every golf club in Ireland to nominate one individual as its Dubai Duty Free Irish Open Ambassador and become he main point of contact at the club for all things relating to the Dubai Duty Free Irish Open. “The Irish Open has always been very close to my heart but I would love this year’s event to be even more special as it will once again be hosted by the Rory Foundation,” McIlroy said in a statement. “I am extremely proud to come from these shores and we are truly blessed with loads of great, accessible courses which I have no doubt have played a big part in Ireland punching well above its weight with the exceptional golfing talent we have produced, north and south, over the years. “I want the entire golfing world to know this and the Dubai Duty Free Irish Open is the perfect vehicle as it showcases the quality of our golf courses to more than quarter of a billion homes around the globe. "With this in mind, I’m determined to make sure that the Irish Open, which has grown tremendously in recent years, maintains its current status as one of the best events in world golf. Sponsors Dubai Duty Free, who recently agreed to extend their agreement for three years until 2018, estimated that they got $150 million worth of exposure from last year’s championship at Royal County Down. No big name players have been announced yet but there are plans to have as many of the 2006 Ryder Cup team members as possible compete. They could include Tiger Woods but the 14-time major winner hasn’t played since last August and as he’s currently recovering from a fourth back surgery, he has set no date for his return to the fairways. McIlroy recalls going to the Irish Open by coach as a young teenager in 2003 and 2004, leaving Holywood Golf Club at 5am to see his idols in action at Portmarnock and Co Louth. Those Irish Opens were not the huge sell out events of yesteryear but the venues (even if Portmarnock’s men only rule is a problem) are believed to be high on McIlroy’s wish list for future Irish Opens south of the border. In Northern Ireland, Portstewart has been touted as a potential venue for next year. Rory McIlroy in action at Congressional in June. Picture Fran Caffrey/www.golffile.ieRory McIlroy could be tempted to skip next year’s Irish Open for a return visit to the scene of his record-breaking US Open triumph. At least, that appears to be the scenario facing the player, his management and the European Tour as the 2012 schedule hoves into view. 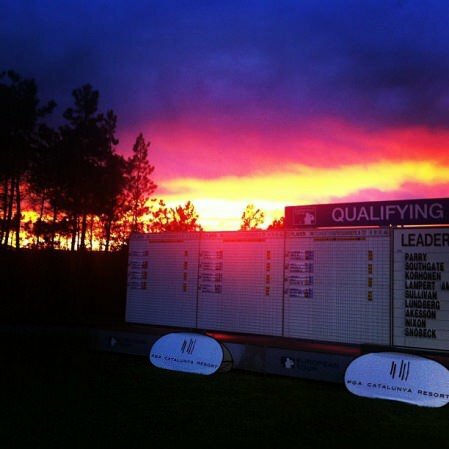 Sunset at the European Tour Qualifying School Final Stage at PGA Catalunya Resort. Rory McIlroy’s Race to Dubai win and his decision to leave Titleist for Nike dominated the end of season chat as Shane Lowry clinched his first win as a professional and David Higgins won back his tour card. Naturally, the scramble for the 2014 European Ryder Cup captaincy was also a hot topic at the close of an epic 2012.